Whether you're looking for an outfit for sangeet or a wedding, Saldanha Label's handcrafted lehengas, sarees and gowns will make you stand out, fo sho! Okay, we get it - we've all grown up watching Bollywood movies and love those elaborate gowns, sarees and lehengas that we see on the big screen (or even on Instagram, for that matter!). If you're inspired and are looking to strike the perfect balance between a smoke storm and a princess at the next big event, head to Saldanha Label in JP Nagar. 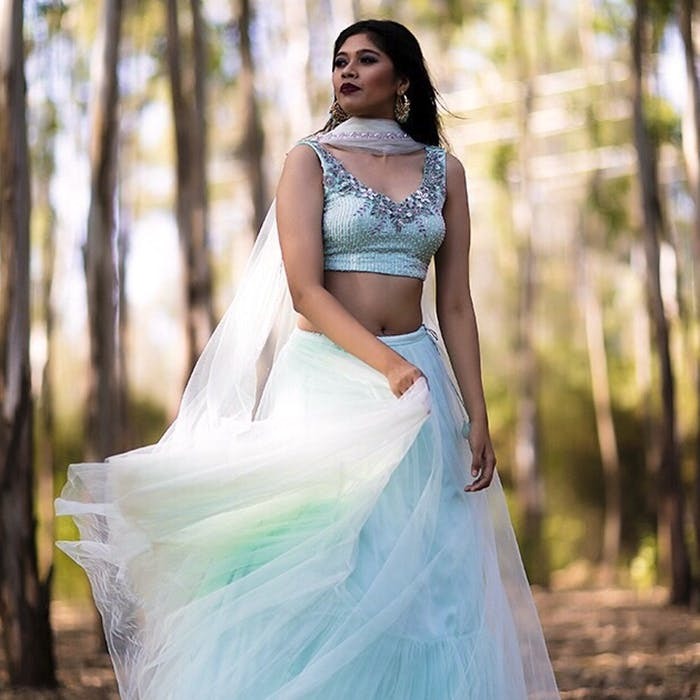 Started by Leona Saldanha in 2018, the boutique specialises in occasion wear like Indo-western style wedding and cocktail gowns, pret and bridal wear. Some of our favourite pieces were their hand embroidered sarees paired with regal looking blouses, a rose-gold crop top and skirt set, and a long, blue trail gown worthy of the red carpet. Prices start from INR 3,000 for the hand-embroidered blouses and INR 10,000 upwards for the embroidered lehengas and gowns, but you can also get something custom made, based on your budget. Book an appointment with them and visit the studio for a consultation. You can either choose to buy any of their sample pieces, or get a design consultation to get a custom outfit tailored. Everything, from the blouse to the dupatta is handcrafted within the studio, so rest assured you'll find something perfect for you (and fits your budget, too). Time taken to deliver a product depends on the level of detailing you ask for, so make sure to plan in advance! They even make occasion wear clothing for kids.